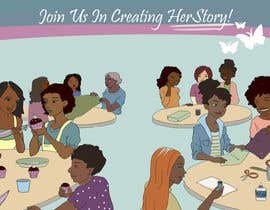 UPDATE: I have included an attachment that shows sample illustrations of African American women. Please do not copy these illustrations but use them as a guide to what I'm looking for in this design. The instructions for the design are included below. Thank you!! 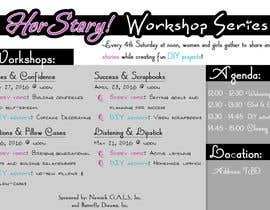 We need a flyer to advertise our 4-month workshop series. We would like a front and back design. Please see the attachment for event details. FRONT: The front design should be an illustration of diverse women and girls working together on various DIY (do-it-yourself projects). The types of projects they're working on should correspond to the 4 workshops in the series (see attachment). 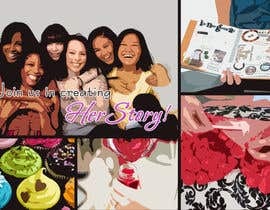 In the illustration the women and girls should be having fun, talking to each other while doing things like making jewelry, decorating cupcakes, scrapbooking, etc. The women and girls should represent various ethnicities and ages, with black and brown women and girls making up the majority of the group. 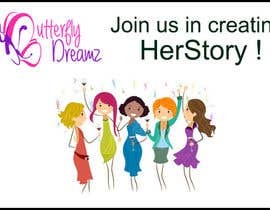 The only words on the front cover should be "Join us in creating HerStory!" Please see attached for a schedule and description of the different workshops. 3. 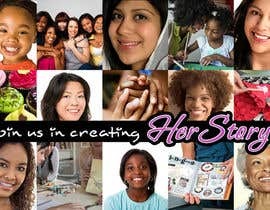 The title of the series, "HerStory Workshop Series"
6. 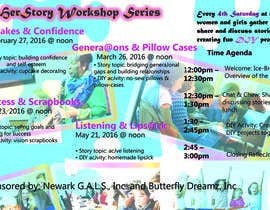 The words, "Sponsored by: Newark G.A.L.S., Inc. and Butterfly Dreamz, Inc."
Design size and page layout: We will be creating half-page flyers with this design (8.52" x 5.47") and would like the design to be landscape. Kindly check the back design. Hello All! I have noticed that a common theme in the designs is a lack of diverse illustrations of women and girls. As I mentioned in a couple comments, most of our attendees are African American women and girls. Because of this, I would like them to be reflected primarily in the design. I have updated the brief to include examples of illustrations I found online and love. Please take a look and use them as inspiration in your designs. Thank you again for your submissions!